Make happy hour even happier with Hydro Flask's 64 oz Insulated Beer Growler. From binge-watching campfires to counting constellations, their Fresh Carry System™ and TempShield™ double wall insulation keep every sip of your IPA brew as carbonated and icy cold as when it was first poured. 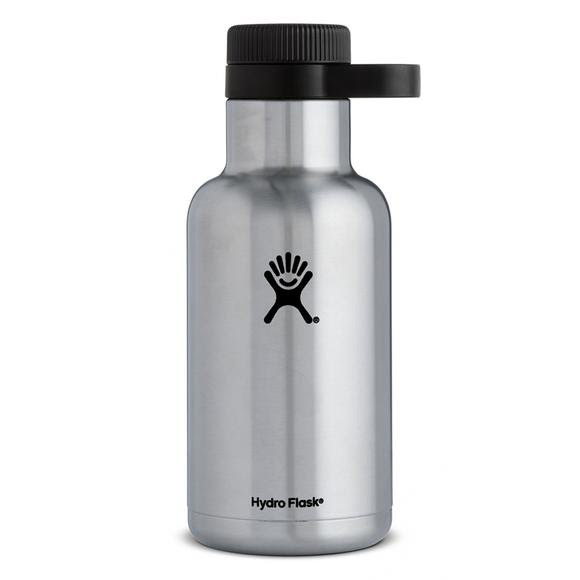 Make happy hour even happier with Hydro Flask &apos;s 64 oz Insulated Beer Growler. From binge-watching campfires to counting constellations, their Fresh Carry System™ and TempShield™ double wall insulation keep every sip of your IPA brew as carbonated and icy cold as when it was first poured. Plus, the streamlined handle makes our Growler easy to carry from tailgate to camping chair, and even easier to pour into their handy 16 oz True Pints. Featuring the Fresh Carry System™, which provides a leak-proof seal with improved temperature control and easy portability, the Growler was designed with beer in mind. We carefully crafted every detail to ensure your favorite brew stays as refreshing as when it was first poured. Used in every product they make, TempShield™ is Hydro Flask&apos;s double wall, vacuum insulated technology that guards the temperature of your drink. Bring ice water with you in the morning, and we promise you&apos;ll still have ice in the afternoon. Hectic morning getting in the way of your coffee sipping? No problem. They&apos;ll keep it hot until you&apos;re ready. They also guarantee no condensation or heat transfer to the outside of the bottle, ever.